"Ive been alotta place but being at the shaolin temple n china has brouhht a tear to my eye buddha blessed," Shaq recently tweeted. So he cried on the shoulder of a giant panda, and turned that frown upside down. Here he is with Shaolin monks, "blessed." His words, not mine. And he's learning about hashtags — "Shaqtags," naturally — and photoshopping himself into Men's Fitness covers. He's also doing this. And it's all because one giant panda reached out to him and made him smile, because that's what pandas are for. That's what Shaq is for. 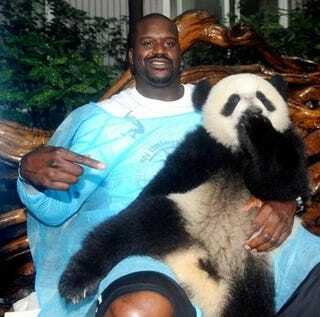 That's what photos of pandas sitting on Shaq's lap are for. Let's not forget it anytime soon. Meanwhile, we'll turn to some more wisdom from Shaq to take us into the evening: "Just because your certified , doesn't mean your qualified." Thanks for your continued support of Deadspin. Tomorrow: More mutton-busting.